Established in 1975, Triangle Mobile Discotheques is one of the oldest established Professional Full Time DJ Businesses and best know companies in Bristol and the South West with a long pedigree supplying professional services to both the public and corporate businesses. Your Wedding is most probably the most important day of your life. A day when you need to rely on so many people to make that day really special. The gown supplier, the cake supplier, the food supplier, and last but not least, your evenings entertainment supplier. What are you planning on having for this party a Disco or Karaoke, or maybe both for your event? The choice is yours. Have you been given the task of organising this years Christmas or New Years Eve Party? Each year from the middle of November until early January collectively our DJs perform at over 200 Christmas parties. Whether it’s an informal works party or a Black Tie event, we can cover it all from 50 to 500 guests. So its up to you to organise the Company After Conference Party, Company Presentation or maybe its the University Ball ? Well you've come to the right place for your Disco or Karaoke entertainment. Thinkng of a fancy dress or Theme Night? for any other type of event contact us! Your Wedding is most probably the most important day of your life! A day when you need to rely on so many people to make that day really special. The gown supplier, the cake supplier, the food supplier, and last but not least, your evenings entertainment supplier. 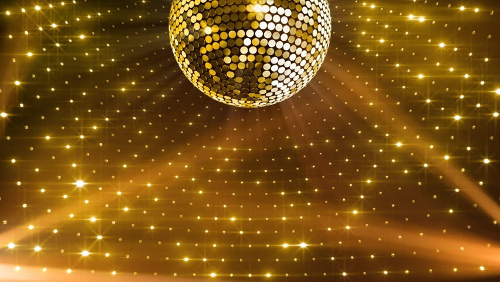 Having a disco for your guests on that all-important evening is, sometimes the last thing you probably think of, but never the less just as important, and you need to choose a reliable company. We perform at over 350 weddings each year and we’ve been doing that for over 40 years, so you could say we’ve got plenty of experience on how a Wedding Evening should be. 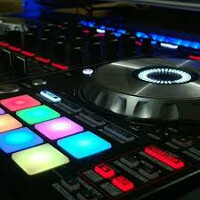 With six experienced DJs (some from local radio) we will have a DJ to suit your musical tastes. Talking of musical taste, you have complete control over what we play. If you wish you can supply a short, or full list of music to be played, or leave it in the capable hands of our DJ with his knowledge and experience to select the music appropriate to your guests. Some clients have, in the past, brought along ‘A Special Song’ which means so much to them, to be played for that all important ‘First Dance’, again our DJ will play this at the appropriate time during the evening. This is of course if our DJ hasn’t already got it in his extensive range of CDs. 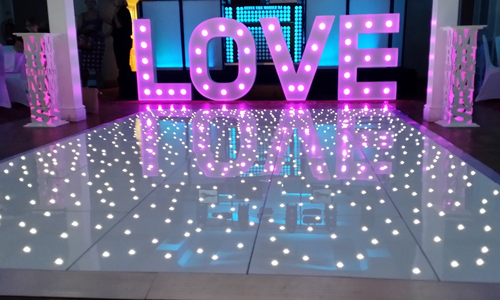 If you wish to have the Disco set up before your Wedding festivities take place we can help you with that as well. Contact us now for your FREE no obligation quote. We individually price all functions enabling us to give you the best possible price without you having to sacrifice the quality you deserve. If you book us you can cross one more thing off of your wedding 'things to do' list. Having a family Birthday Celebration? What are you planning on having for this party a Disco or Karaoke, or maybe both for your event? If its an informal family party or a black tie event, we can cover it all from 50 to 500 guests. 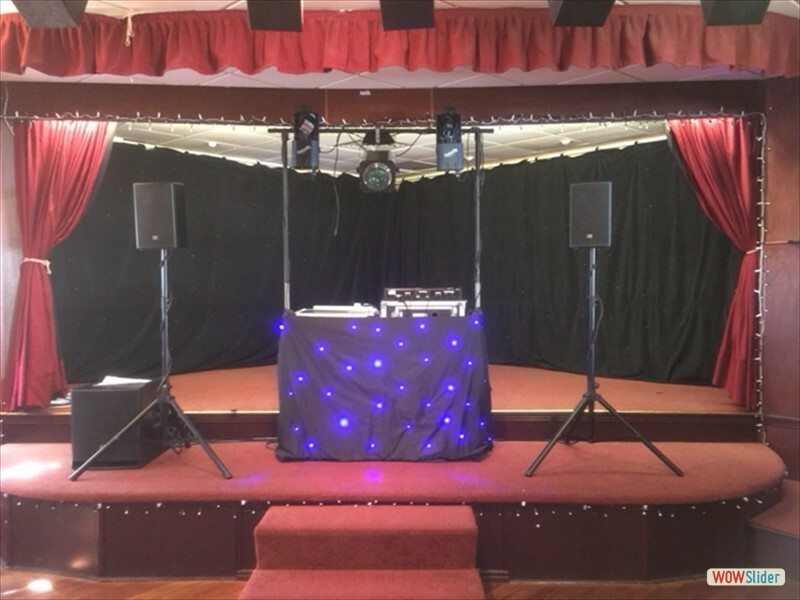 With six experienced DJs (some from local radio) we have the DJs to make your Family Celebration a success, just leave the party in the capable hands of our DJ with his knowledge to select the music appropriate to your guests or if you prefer compile your own list of favourite dance music you wished played. 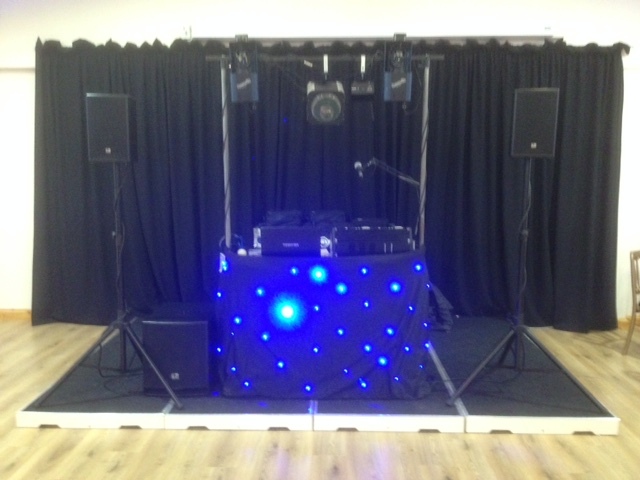 If you wish to have the Disco set up before your party takes place we can help you with that as well. Book us! Then you can sit back and relax and get ready to greet all those family members or long lost friends. Have you been given the task of organising this years Christmas party or New Years Eve? Well you've come to the right place for your disco or karaoke entertainment! Each year from the middle of November until early January collectively our DJs perform at over 200 Christmas parties. Whether it’s an informal work’s party or a Black Tie event, we can cover it all from 50 to 500 guests. 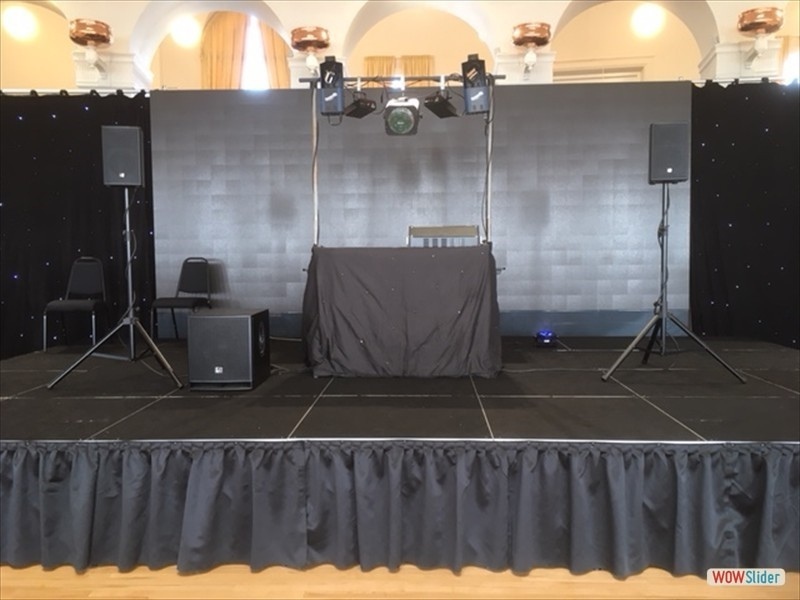 At this time of year we supply our show to some of the South West leading Hotels & Conference Centres, who want our reliability & professionalism to ensure everything to do with the entertainment is going to run smoothly. 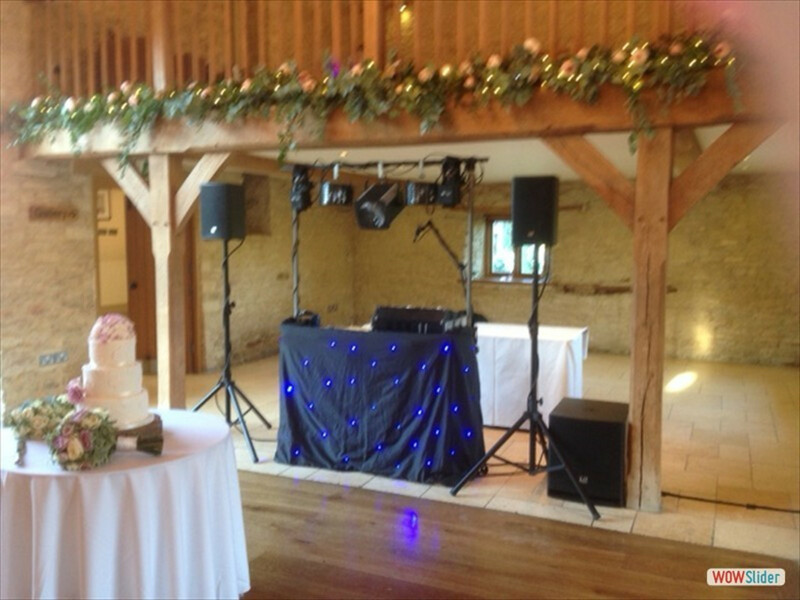 With six experienced DJ’s (some from local radio) we have DJs to make your festive celebration go like clockwork, just leave the party in the capable hands of our experienced DJ with his knowledge to select the music appropriate to your guests. If you wish to have the disco set up before your seasonal festivities take place we can help you with that as well. Don’t forget to book early as regular companies come back year after year for our services. Book us and have one thing less to worry about at this Christmas or New Year Celebrations. So its up to you to organise the company After Conference Party, Company Presentation or maybe its the University Ball ? Well you've come to the right place for your Disco or Karaoke entertainment. Throughout the year we are called upon by leading Hotels & Conference Centres in the South West to provide their clients with top quality shows. Whether its a Black Tie event or an informal occasion, we can cover it all from the smallest of hotels to the British & Commonwealth Exhibition Centre in Bristol, 50 or 500 people. Leading Hotels, Conference Centres and Event’s Organisers book us for our reliability & professionalism to ensure everything runs smoothly and successfully for their clients at their Conference or Presentation events. With six experienced DJs (some from local radio) we have a personality DJ to make your after dinner celebration everything it should be, just leave the party in the capable hands of our experienced DJ with his knowledge to select the music appropriate to your guests. 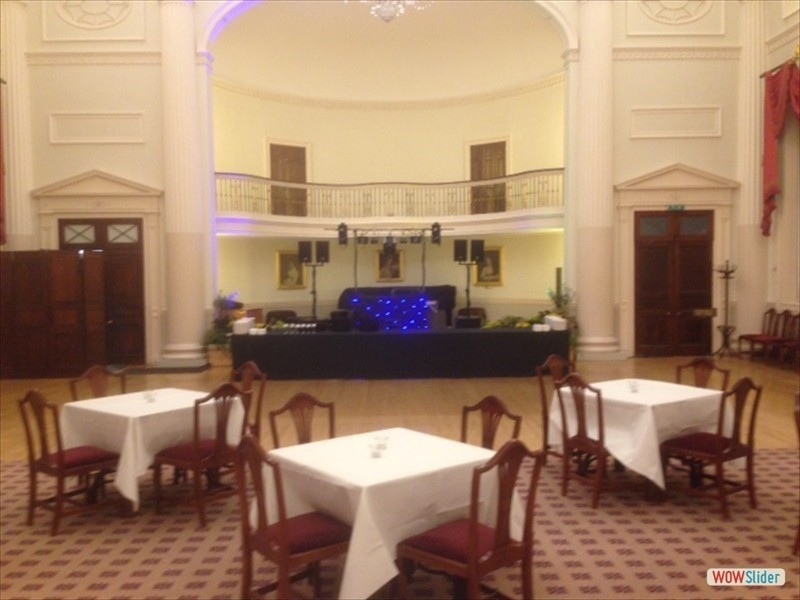 If you wish to have the Disco set up before your Conference or Ball takes place we can help you with that as well. Book us and have one thing less to worry about at this years Presentation, Conference Party or University Ball. "Are you any good?" 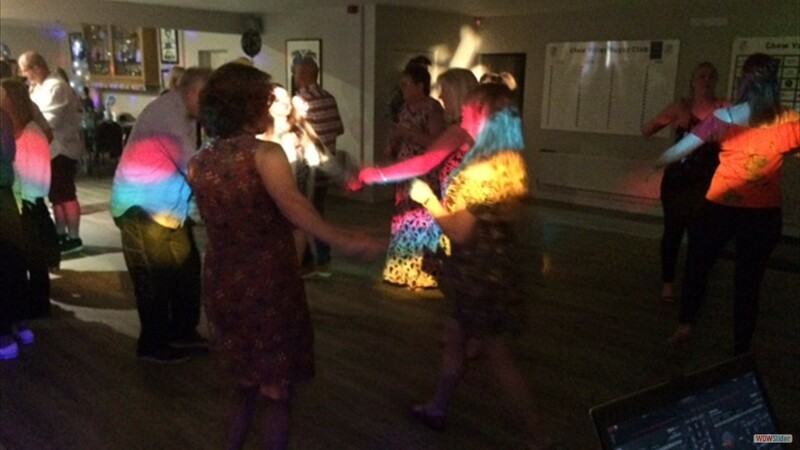 We have been supplying mobile discos for private parties for the last 40 years. If we were not good at what we do we would not have lasted this long. Along with this our parent business, Oasis Sound & Lighting, we have been supplying audio and lighting equipment to the trade for the same length of time. "Why choose us?" With so many things on your mind when arranging your Party or Wedding we really do appreciate how difficult it is to make all the right choices when it comes to choosing a supplier. We also realize that with a Wedding, a disco it can easily become the last on your list of choices, after all, the evenings entertainment is the last item on the big day itself, but can be the 'icing on your cake' of your special day and have your guests talking about the disco you choose for months to come. "What do I get for my money?" With the price of organising a Party/Wedding getting higher every year it is important to budget for all aspects of your event, but remember, when it comes to booking a disco it really is a matter of "you get what you pay for". Quality and reliability. We feel it is essential to discuss details with you so that we fully understand your requirements, including the genre of music, your first dance. We believe in minimum talking during the evening (unless you wish otherwise), as our music does the talking for us. If required we can visit the venue with you, prior to the date, to finalise all the details and to give you peace of mind. All of our DJs are true seasoned professionals that take a pride in their work and appearance. No scruffy tee shirts and jeans here. You don't want some untidy guy and his girlfriend turning up with a couple flashing beacon lights and a sound system that is inadequate and hurts your ears when its playing in a packed venue. Most people who operate like this don't have the relevant Public Liability Insurance or their equipment PAT tested for safety, details of our Insurance are always available for you to see at every show, just ask the DJ. As for the company we stand on our reputation for service to you the Customer. When looking for quotes don't think the cheapest quote you get, will be the same standard as the higher quotes, it won't. The fees charged reflect many things, such as the quality of the DJ, equipment, sound quality, range of music and experience of the DJ. We pride ourselves on our service, quality and reliability. All of our DJs are true seasoned professionals that take a pride in their work and appearance. "Is there a light show?" Yes, every show booked comes with a full State of the Art light show and quality sound system to suit your venue. All our equipment is PAT tested. This is an electrical equivalent to an MOT for a car. All our equipment is of the latest technology and our light shows consist of scanners and moving light effects where possible. 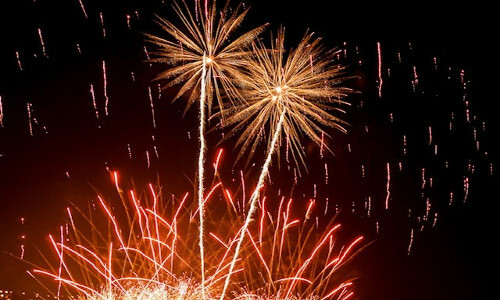 Other special effects such as Lasers, Smoke machines etc., can be discussed when you are booking, Subject to venue restrictions. "Can I choose what music is played?" Yes, you have full say in what genre music you would like played. Once we have confirmed your details you will be sent a booking contract and music request sheet for you to complete. You will be able to list any particular tracks you would like included and any, which you do not. We are happy to include requests from your guests throughout the evening. 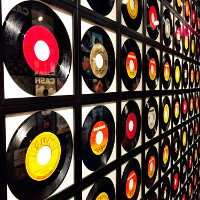 Customers have the right to choose what type of music genre they would like played. That all-important tune for that First Dance at a Wedding is very important to the Bride and Groom. When choosing general tracks to be played for the rest of the evening, please remember that whilst some tracks are fantastic to listen to, sometimes they do not transfer well to the dance floor. The DJ is there to give your Guests a good time on the dance floor with the appropriate music. "How much do you cost?" As you can appreciate each party is tailored to suit your precise requirements and details, as would be the price. Whether it is small or large, a Wedding or Family Party, value for money is always assured. When you enquire we take time to go through all the details, how many guests? Where the Venue is? Size of the Venue? Your choice of music, any special effects required Lasers, Bubbles, Snow, Mist or Fog. The more information you give us, the more we can make your party the true success you want it to be. We are dedicated to finding out what you want and not giving you anything less than that. We don't just quote you a 'One size fits all' show. We are not an agency and therefore this also enables us to offer very competitive prices, as agency fees can be a significant added cost. "What type of functions do you cater for?" During the year and mainly the summer months 90% of our bookings are for Weddings. Nothing is beyond our remit, Wedding Anniversaries, Corporate work, Black Tie Dinner parties, University and Charity Balls, School Graduation, Garden Parties, Awards Ceremonies, Christmas Parties, including Promotional Launches. Any Celebratory Occasions you can think of really including New Years Eve, Halloween, St. Valentines Night, St Patrick Day, Easter Brides, Christmas Brides, Bonfire Night, 6th Form exam success, Christenings and Retirements. "Will you work or travel anywhere?" Within reason. Functions in marquees or outdoors can be catered for. Distance is no object, but most people who book us are within a 75-mile radius of Bristol. We do have regular clients, which require us to travel to Exeter, Torquay and stately homes in Bristol, Bath, Corsham, Frome, Trowbridge, Calne, Stroud, Chippenham, Avon, Wiltshire, Somerset, Gloucestershire, North & Bath & North Somerset, Swindon and South Gloucestershire. "Are there any references you can supply?" Our greatest reference is that the following are just some of the Venues that recommend our services to their clients when they are needing Disco entertainment for their forth coming parties. Bristol City Stadium, Ashton Gate, Bristol. Swallow Hotels & Inns, Bath. The Ramada Jarvis Grange Hotel, Winterbourne. They will, if required, supply references and also would welcome discussing your forthcoming event with a view to booking their venues. The Pavilion at Bristol Zoo. Tortworth Court Four Pillars Hotel, Wotton-Under-Edge. Marriot Hotels, Bristol & Bath. ... plus many, many more, too numerous to mention. "Do you do any regular venues where I can see you perform?" Yes. These are normally for Hotels catering for their client's Weddings, Corporate functions, Xmas Parties etc. but seeing us can be difficult as all the work we undertake are for these private parties such as yours would be. You are of course welcome to visit us at our 1,500 square feet premises to discuss your concerns or we will visit you at the venue if it is not known to us. "What is the largest venue you can do?" We haven't come across a venue yet which we could not service. Sound systems start at around 600 watts and are tailored to suit the venue as is the light shows. Please note all our volume knobs can go down as well as up, unlike some of our competitors! "Is my Booking confirmed in writing?" Yes. All important details are confirmed back to you in a contract letter asking you to confirm on your commitment by a deposit payment. When we have received your deposit we will confirm this, again in writing, assuring you that your booking is secure with us. "Can I have my deposit back if I have to cancel?" Yes, *subject to conditions with written notice as outlined in your contract or deposit letter. A handling charge may apply. "What back up is there?" We have full Public Liability Insurance up to £Million. Also the parent business Oasis Sound & Lighting gives a full equipment backup service. See our website www.oasis-online.co.uk for details. "What if the DJ is taken ill or has an accident prior to my event?" Illness and accidents can take place any time, as we all know and we will be sorry that the DJ you requested would not be available, but the show will go on with a replacement DJ. Enabling your function to still proceed with the least amount of inconvenience to you. "How far in advance should I book and how difficult is it to book your services?" It is always advisable to book well in advance especially in the busy Wedding and Xmas periods to avoid disappointment. Bookings or quotes are normally conducted over the phone or by email and whilst we are waiting for your confirmation your booking is secure for 10 days. All quotes are on a 'No Obligation' basis until you confirm. Once again when we have confirmed your details you will be sent a booking contract and request sheet to complete. You will be able to list any particular tracks you would like included and any, which you do not. We are happy to include requests from your guests throughout the evening. So, having answered those questions what are you waiting for? Ring us now on 0117 963 7355 and talk to us live, put us to the test! We hope we have convinced you that you won't be disappointed. We aim high to give you the very best service when booking one of our 6 shows giving you the Perfect End to your Special Occasion. These are the profiles of a few of our DJs who work for us, we also have a number of other DJs who work for us who are not mentioned but never the less most capable of delivering a first class show for your very special occasion. If you are a Presenter / DJ and are interested in working for us, why not give us a ring so we can discuss your future with our team! Founder DJ of Triangle who has many years of experience heralding from the 'hey days' of the Tamla Motown, Soul and Funk era of the 60s & 70s. Gaining his experience from working as a Compere and Personality DJ in venues that now form part of Bristol music history, i.e. the original 'Rummer Bar', 'Top Rank', 'Meccas Heartbeat' and 'Baileys'. For 10 years from 1990 to 2000 he was the preferred DJ for the Queens Moat House and Holiday Inn, one of Bristols most exclusive and important Hotels. John now specialises in parties for the more mature audience who would, in part, like to re-live their youth when celebrating 40th/50th birthday parties and anniversaries. He is in much demand for Wedding parties and Balls that require a DJ who can cater for all ages of guests. John plays such venues as Priston Mill, Hartham Park, Ashton Court, Hayley Conference Centre's, Bailbrook Conference Centre and Leigh Court for leading business's and corporate black-tie functions. Some of the famous Celebrities John has entertained are Prince and Princess Michael of Kent, Jane Seymour, Sarah Maughan and Trevor Eve, Leo Sayer, Darren Crompton (Bristol Rugby Club, England Rugby team), Gloucestershire Gladiators (when they won the Triple). Roger was the Breakfast presenter for Star 107.9, Stroud Radio since April 2003. Now working on Radio Bristol. He gained his experience in radio with a full time position in 1990 with GWR, Galaxy 101 and Galaxy Birmingham, after working in hospital radio in the Bristol Royal Infirmary in 1985. He has also worked a regular Wednesday spot at the Mega Bowl (now luxury flats) in Ashton which he maintained for 10 years. Functions such as Birthday parties to Fun nights or the Classic Wedding parties, and more are well within Roger's remit. All aspects of music from classical to the latest sounds are in Roger's collection, but he especially likes playing Dance and R 'n' B. Starting out on the radio, presenting to the valleys of South Wales, Dan moved to Bristol to present Traffic and Travel on Radio Bristol, Gloucester and Somerset and even down to Devon and Cornwall! Dan is a true Professional in every thing he does, musically there is nothing he doesn't like playing, from 70s - 80s pop, 90s classic's to present-day pop music. He can cover any age or occasion, be it a cheesy sing a long, a trip down memory lane with the classics or a night of all the latest hits! As a lover of music, Dan can pretty much cater for whatever you need, he ensures all guests have a good time. Always willing to play requests. He draws from his vast experience to keep an audience on the dance floor. Ben was the morning presenter on Swindons 107.7 Brunel FM, previously to that Star 107.2 FM until 2005 now working for Radio Bristol. He has proved to be a popular choice of DJ for parties as the music he tends to play is an 'All Round' selection of tunes for all ages from 16 - 60. Ben returned in 2006 from working aboard cruise ships alternating between the Caribbean and Mediterranean. Music ranges from the 60s to the latest top tunes. Its also only fair to point out that whilst on the cruise ships he had to cater for Indian and Caribbean music. So he can cover more than the average DJ when it comes to musical tastes. which says we must be doing something right! Sorry for the delay in sending but this kept meaning to say thank you so much for providing our disco for our 30th Wedding anniversary celebrations on Saturday 9th August 2014 at the PBA Sports + Social Club. The music played was spot on it met all our requirements, playing quietly in the background to start with allowing family and friends to catch up and talk and then after the food, speeches etc it was just as we requested and the dance floor was constantly being used for the rest of the evening. The party dances were well received by young and old and a fun night was had by all. The evening was a great success and this was also down to in part to our wonderful DJ thank you very much. We would not hesitate to recommend your company is anyone should ask us in the future. Just wanted to say thank you for an amazing disco on Friday night. 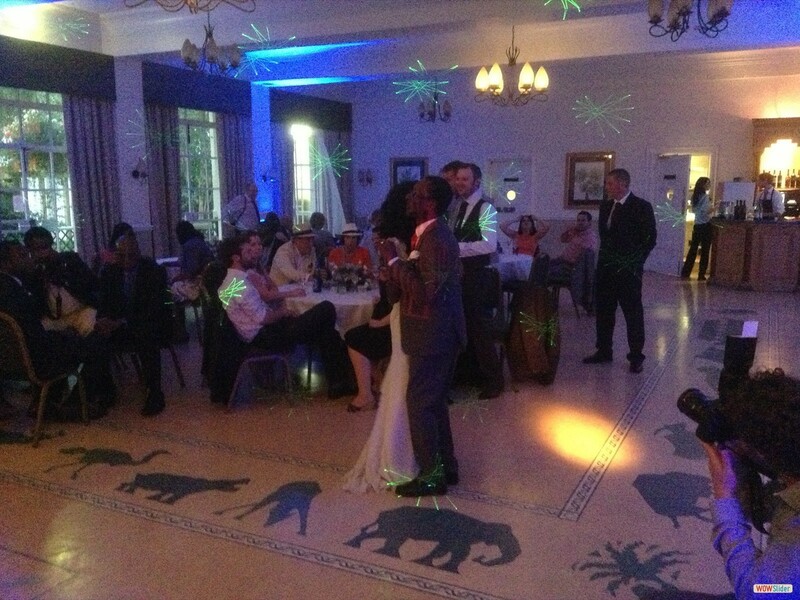 All my guests had a great time, the DJ was great and played a good variation of music which kept us all dancing. I will definitely be recommending to friends and to people booking functions here at the centre. "You and the team deserve a big pat on the back. It was a very good night. My friend Julie and I are both looking forward to the next one and will spread the word. The atmosphere was friendly. The music kept the dance floor full. Nice venue. The little touches to detail in the decor made it feel special and the fact that you took time to physically say hello and welcome people was brilliant. Julie and I had previously been to two other pof nights. I won't say where but they were quite frankly rubbish. Last night was brilliant. Hats off to you for your hard work and thankyou for making us feel welcome." Thank you so much for a great evening. I certainly will be recommending you in the future. So with that in mind would you be free to come to Thornbury Golf centre , Saturday 26th of July as I said if we find good partners who we work hand in hand with it becomes easy and the trust." "The gig sat night seemed to go down well and it was fairly mental for me hence I never spoke with you much as chatting to my customers , but the punters seemed pretty happy and dance floor was full to the end as to the numbers I was well pleased as its holiday time and more people than at Cadbury." 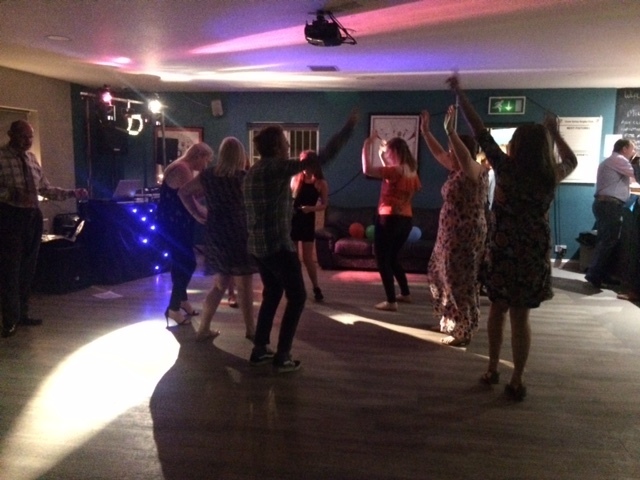 Many thanks for you and Roger for doing a fabulous job at my 50th party @ Oldland Village Club - Saturday Aug 2nd The evening flowed and this was helped by the order in which the music was played and the variety. 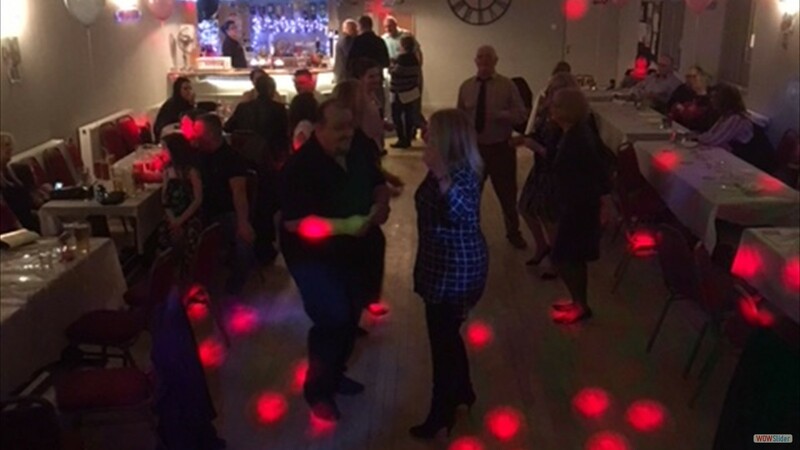 It was a wonderful evening , enjoyed by all , and lots of positive comments were made I would not hesitate to use you again and I would definitely recommend your Disco services. ... Still not convinced? See 32 more reviews! I just wanted to thank you for the great job you did and contributing to my daughter's 21st and engagement party. She had a very, very wonderful time. DJ John, 2nd March, Horfield Parish Hall, Bristol. "Hi John, would like to just say thank you for the great professional service I have received from you and your DJ (Dan) on Saturday. Will be using you again later this year. DJ Dan on 1st March at Claverham Village Hall. 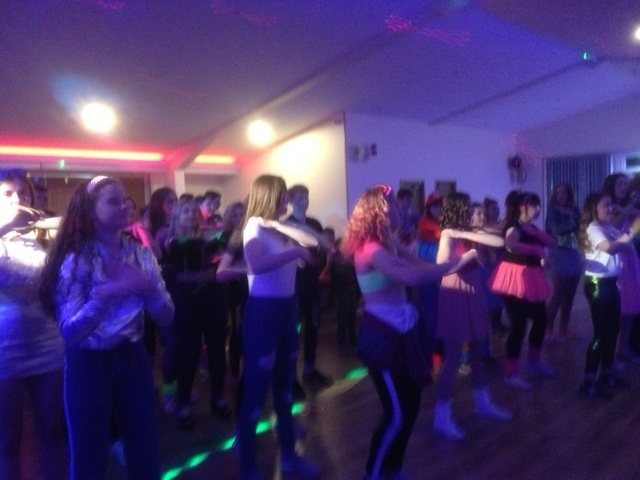 "We had a GREAT EVENING, much better than last year, music and DJ was Far Better, had everyone dancing away, my feet were killing me by bedtime. 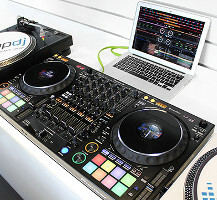 Also the equipment he used was good quality and did not distort the sound"
Alexandra House, Swindon, DJ Dan. Just a quick note to say thanks for Saturday night, everyone had a great time and Dad really enjoyed himself celebrating his 60th Birthday. All the right tunes, at the right time, at the right volume. Can you do his mates 60th in a couple of weeks time it’s also at the City Ground, I’ve told him it may be too short notice?" Bristol City F.C. Ground, Ashton Gate, Bristol, DJ John. Just a note to say thanks very much for the Disco on Friday. Lots of people said how much they enjoyed it. I was very keen that you should play my list of music for the party and one of you guys confirmed with my wife that this would be acceptable with you. There will be a few older guys and lots of people in their 50s and a few young 'uns as well. As you will see I like rock music and am keen that that should be the main theme. You played exactly what was on the list." Steve’s 60th Birthday at Bristol City F.C. Ground, Ashton Gate, Bristol, DJ John. "Hi John, You were very good at our Ladies Night last Saturday at The Hayley Conference Centre. The music was played at the right volume throughout the night, everything when smoothly with our guest performers, especially Roger De Courcey & Nookie Bear, you helped to make it a great night. Thanks from all at the Cymbeline Lodge"
DJ John Jeremy at Hayley Conference Centre, Swindon. I would like to say a MASSIVE thank you for the fantastic service you provided on Saturday Night! Everyone I spoke to has been raving about it, and I've been giving your phone number out like it's going out of fashion. I always recommend your company through my business! I hope you get some good follow up business from it. Apologies again that I never got to thank you I person. 90th Birthday Party, Hayley CC in Swindon, DJ John Jeremy 2013. "We hired Triangle for my daughters 11th birthday party and were very impressed with the disco/karaoke itself, the booking procedure and the DJ's helpfulness. The tunes played were up to date and got all the kids on the dance floor. The karaoke went down a storm and the time flew by. We would certainly hire Triangle again". Barrow Gurney on 9th July 11, DJ John Jeremy. "To John, A quick note to say a big thank you for the fantastic and memorable Wedding Disco that you put on for our Wedding at Brokerswood a couple of weeks ago. The evening was a great success and you managed to keep the whole crowd very happy! We wouldn't hesitate to recommend you to anyone looking to arrange a similar event, best wishes Tom & Tina." Brokerswood House on 18th June 11, DJ John Jeremy. "Hi John, Hope you got back safely on Wednesday evening/Thursday morning! Just a brief note to say thank you for coming along to our staff conference on Wednesday evening and also for staying on the extra hour - everyone really enjoyed themselves!" Castleoak Conference at Hayley C.C. on 29th September, DJ John Jeremy. "Thank you for the wonderful service that was provided at our Wedding on 21st August 2010 at the Claverton Rooms in Bath University. The DJ was fantastic - professional, created a brilliant atmosphere.... a brilliant time was had by all. Please pass on our gratitude, it was the best party we've ever had!, thanks again"
Mark & Louise Field's Wedding, DJ John Jeremy. "Hi, I just wanted to send a quick note in between packing for our honeymoon to say thank you to the DJ and the person who set up. We had the most amazing day, topped off by dancing to a brilliant selection of music which had the dance floor full for most of the night! Thanks again." "Just a quick email to pass on our thanks to DJ Roger for a great evening's music, and to apologise that I didn't get round to thanking him on the night. He was very good at responding to our guests requests and kept everyone up on their feet for most of the night. In fact the only time the dance floor emptied out was when he played the music I'd asked for in advance - shows what I know!! Of course - one more thing to add is that the music was loud enough for the dancers but not too loud for those chatting!" Wedding on 4th Sept 2010 at Gloucester C.C. Club. My wife and I would like to thank you very much for your music on Friday night at Friary Wood. It was a wonderful day and night and I believe everyone enjoyed the music very much so thank you. Thank you also for helping at such short notice"
Stephen and Jacqueline Lee's Wedding on 8th May 2010 with DJ John Jeremy. "Hello John - I would like to thank you for the great disco you set up for us on Saturday night. We had a fantastic night!! The DJ and music were great - I will definitely recommend you for your excellent, professional service!! No parties for me for a while, but I will definitely pass your number on!" Lee-Ann at Wrington on 6th March 2010 with DJ Roger. "Owen and I would like to thank you ever so much for helping to make our Wedding at Priston Mill on Sunday 2nd August so special. We had a truly amazing day and the evening disco was perfect. The music selection was excellent, the dance floor was never empty and every one of our guests thoroughly enjoyed themselves. 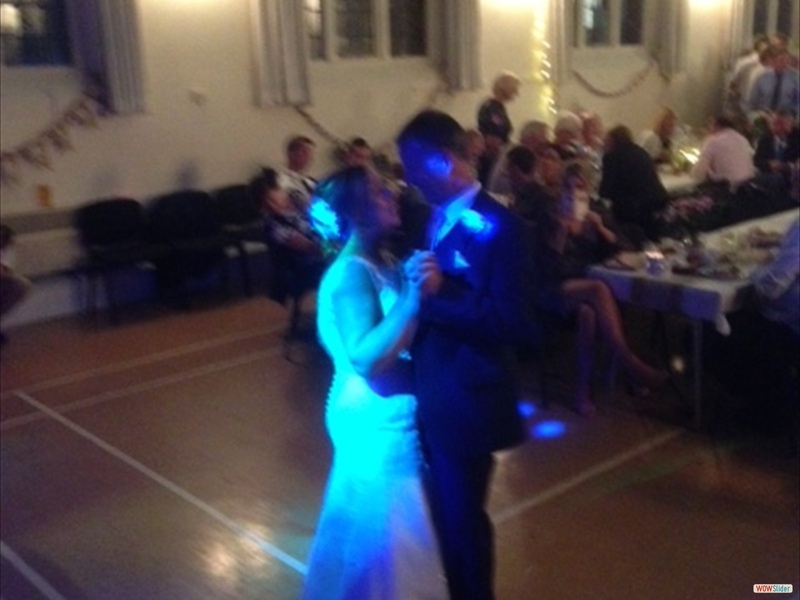 I would also like to say a special thank you for playing our own version of ‘Rule the World’ for our first dance. Also for playing our song again at the end of the night as our lantern flew into the sky was beautiful touch and really was a wonderful end to a fantastic day. Thank you." 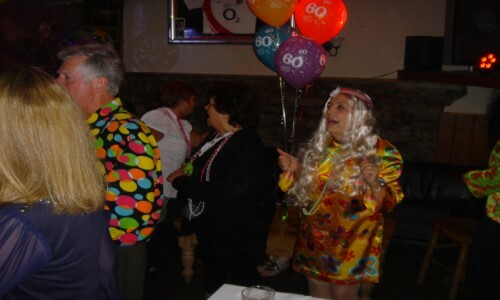 "We had a fantastic Fancy Dress 70's Karaoke/Discos to end our conference. The disco you provide was brilliant, more that what we expected with all the fantastic Hits from the 70's and even the DJ Dressed for the part. Would really recommend him for a great themed night, well done." Cable & Wireless, Principal/Hayley Conference Centre, Swindon on1st July 2009, DJ John. "Hi, Just wanted to say thanks for a great job last night - tunes were spot on and was great to have people dancing all night!" Hayley & Ian's Wedding at Bristol Zoo on 16th May 2009, DJ Roger. I wanted to send you an e-mail from myself and my new husband to say thank you so much for Sunday night as you did our entertainment in the evening at our wedding at Priston Mill. It was a brilliant night and the music was good, everyone complimented on how professional and good you were. I just wanted to thank you for all your help with our Christmas party 2008. The DJ was fantastic and played some really good music that got us all up on the dance floor. Thank you for also being so understanding about the payment issues. I look forward to working with you again next year." I don't know if you remember but you played at our wedding in May 2005.
free on Sat 21st July? Hope to hear from you soon?" Ruth Garrett (Rebooking 18th May 2007 with DJ Roger). the music and would love to book you for our party on June 9th 2008." Miriam (13th May 2007 with DJ Roger). Just wanted to send you a thank you for DJing at our wedding reception last Saturday. We had a great night and you were great. You played just the right amount of everything and kept the party dancing! Sorry for the rowdy requests on the night however I am sure you are use to that! Lucie & Russ :-) (14th Feb 2009). Just a quick message to say thanks - particularly to Ben - for the Disco for our wedding. Ben did a great job and was exactly what we wanted. He was smart, polite and, most importantly for us, unobtrusive. The music was spot on and we had a great time. Please say thanks to Ben on our behalf, Cheers"
Jon & Diane (20th May 2006, DJ Ben). I just wanted to say a huge thank you for putting on a superb disco at our wedding this weekend. Everything about it was spot on and we had lots of comments from our guests saying how impressed they were too. Thanks again and all the best for the future." James. (Holbrook House 8th Sept 2007, DJ Tony). I realize that I haven't yet put anything in writing about the DJ, so hope it will be acceptable by e-mail. We were very pleased with the service provided of both and would recommend them for others to use. The DJ was very pleasant and played the right selection of music and kept things going at just the right pace - we would be pleased to use the company again, if an event warranted it." Lynn (Bailbrook House 22nd Sept 2007, DJ Roger). 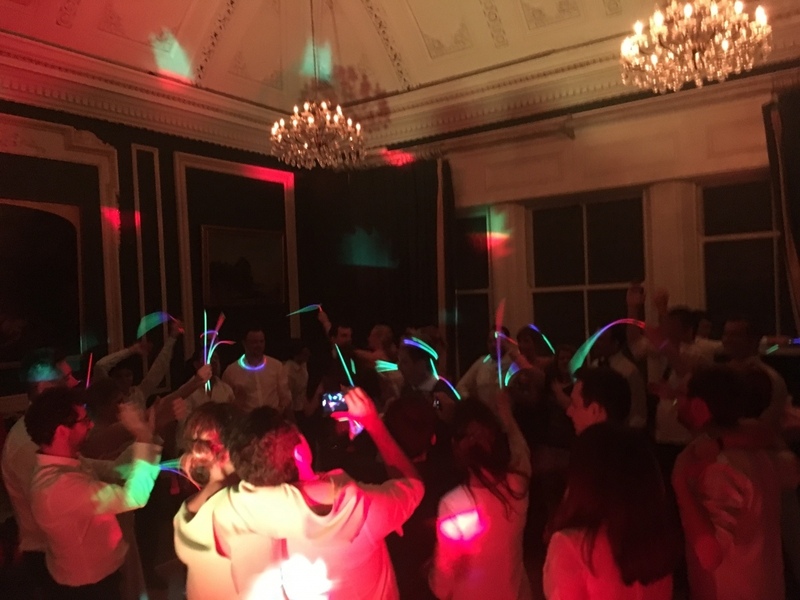 We got married at Bailbrook House on 15th September - just wondering if you could let us know what the DJ was called as we have completely forgotten! Wanted to send thank you card! Bailbrook House 15th Sept 2007 DJ Ben). Adam and I just wanted to say a rather belated thank you for coming to DJ at our wedding on 9th September 2006 at Bailbrook House. You did a wonderful job with the music - it was exactly the kind of music we were hoping for and the dance floor seemed to be full all evening long. All our guests enjoyed the chance to have a good dance at the evening reception, and a number of them have commented on how good the music was. Thank you also for being so organised and punctual - right from us booking, you have been so prompt in responding to us, and in checking exactly what was required, which has been much appreciated. Our best wishes and thanks again for helping to make our day a success. Lilly & Adam Webb, PS - our friend Simon apologises for the constant and ongoing requests for the Wurzels! Thank you so much for providing the music for our wedding reception. The music was perfect for getting people up & dancing! We really enjoyed it! 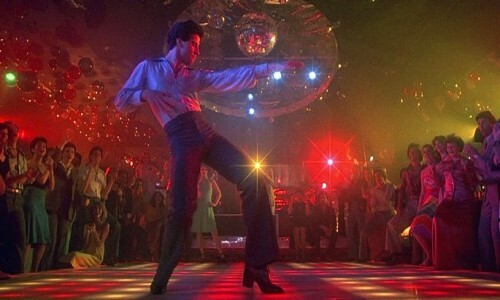 I am writing to say how pleased we were with the discothèque last Saturday. The DJ kept everyone dancing and the choice of music was excellent. There was general agreement afterwards that all had had a very good time. Your disco lights were important in producing the right atmosphere and looked wonderful both inside and outside the marquee. We very much appreciate the good service that you produced." Humphry Barnikel (Wedding August 2006, DJ John). Thank you very much for providing the disco and DJ for our Wedding On the 10th September The DJ (I’m sorry I don’t know his name) was excellent. He palyed just the right music, including our requests,and got every one dancing. Even my Dad was dancing – so he must have been good. An excellent time was had by all, particulery us, and the disco played a big part. Please pass on our thanks and appreciation to the DJ." Sarah & Paul Millington (DJ Roger in Marquee 10th September 2007). Because we were to rapped up in ourselves we forgot to get the name but whoever did Priston Mill on the 18th June 2006, a big thank you for playing everything we requested and being very thoughtful and on the ball! Unlike us! Thanks once again for everything"
Josie & Martin (DJ John). 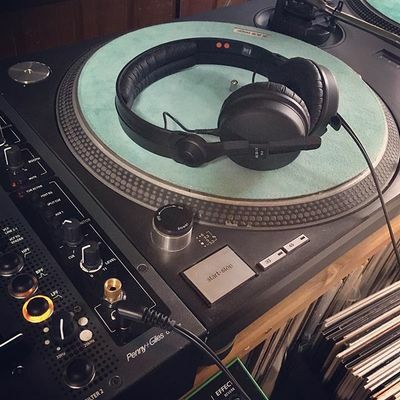 Established in 1975, Triangle Mobile Discotheques is one of the oldest established Professional Full Time DJ Businesses and best known mobile disco companies in Bristol and the South West with a long pedigree supplying professional discotheque services to both the public and corporate businesses alike. We can cater for any event you require from 25 to 1,000 people at any venue from the local bar to the largest Hotel suite! What ever your needs our aim is to provide you with a professional quality service. Most of our Personality DJs are music industry professionals including John Jeremy, and local radio DJ's such as Roger Noble (Formerly of Star 107.2 FM), Ben Williams (Bath FM) and Matt Vaughan (Breakfast Presenter, Star FM) along side many other equally competent DJs exclusive to this company. For businesses we can provide our services for Corporate Events & Office Parties, Wedding Functions, Christmas parties, Dinners Dances, Product Launches & Opening Ceremonies, Balls (events), Themed Events, Open Days and promotions. We also provide residencies for hotels, pubs, clubs and restaurants on a regular basis. All of our equipment is state of the art with modern lighting and sound systems. 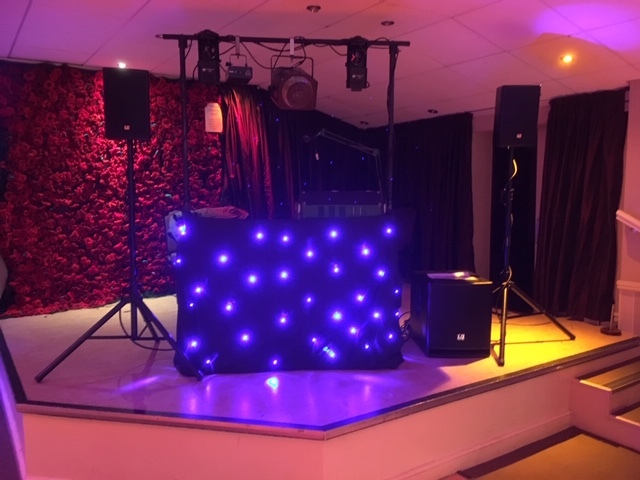 Providing equipment to suit your occasion including Karaoke (our list of Karaoke tracks boast over 1,500 titles to choose from), lasers, snow machines, bubble machines, foam machines and extra lighting. Hiring us is simple - just give us a call or send an e-mail during office hours Mon - Sat from 9.30am to 5.00pm. If you wish to hire only disco equipment, then contact our parent company Oasis Sound & Lighting. If you are a Presenter or DJ and are interested in working for us, why not give us a ring so we can discuss your future with our team! Please provide us with some details of the event you are interested in. If you can, let us know the date and the venue where you would like to hold your event. We will then send you a no obligation quotation. 1) By paying your deposit and/or you confirm your booking(s) in writing/Email to us deems that you accept these Terms & Conditions. You agree that the confirmed details including start and finish times that you have supplied are accurate and correct. Any extension beyond the confirmed finish time is at the discretion of Triangle Discotheques and the Management of the Venue. Any extension to the contracted agreed timescale will be charged in addition to the original booking fee at £50.00 per hour or part hour, thereafter, which shall be payable in advance or on the night to the DJ. 2) You agree to pay our balance fee, in full, in cash to the DJ (if you have not paid in advance), upon arrival of Triangle Discotheques at your venue. 4) The Client shall have the right to CANCEL the booking date(s) by serving upon the Triangle Discotheques not less than 30 clear days notice in writing, failure to do so will incur payment in full for Date(s) cancelled and MUST be paid BY THE DATE OF THE CANCELLED ENGAGEMENT(S). Cancelled booking date(s) of not less than 90 clear days notice in writing will only lose the deposit they have paid. Cancelled booking date(s) more than 90 clear days may incur a handling charge. This also applies to any re-scheduling of booking date(s). There can be no exceptions, as these dates will have been kept exclusively for your function. 5) The Client is responsible for safety and security at the venue and shall be responsible for any person(s) causing nuisance to the D.J, or any other person employed by, or associated with Triangle Discotheques. 6) In the unlikely event that Triangle Discotheques is unable to attend personally due to accident or sudden illness, Triangle Discotheques shall endeavour to provide a suitable substitute offering the same level of service at no additional charge to the client. This does not apply in circumstances detailed in section (7) below. 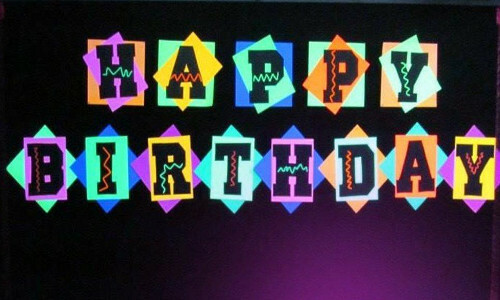 7) Triangle Discotheques will not be liable for failing to attend a booking, where the reason for non-attendance or late arrival is caused by adverse weather conditions (including Snow & Flooding), road closure, traffic accident, fuel shortages, acts of terrorism or other unavoidable circumstances deemed beyond our control. 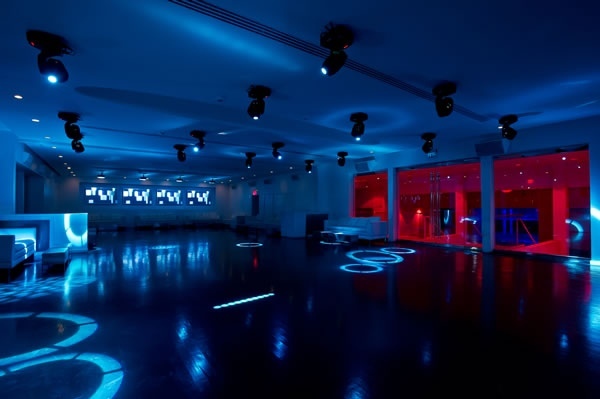 8) The Client will arrange for the venue to be unlocked upon arrival of Triangle Discotheques. The client and venue will allow suitable time for the installation and dismantling, and removal of disco equipment (normally 1 hour each side of the booking times). Where appropriate, the Customer will also inform the venue, in advance, of our requirements. We shall not be liable for any additional charges levied to the client by the venue in relation to our equipment assembly / removal timescales. 9) Where the Function is solely for or includes guests under the age of 16 years, the Client, (or other Adult) is responsible for the behaviour and safety of any minors attending the venue. Where the function is solely for minors, the client will provide and maintain adequate adult supervision at all times. 10) Triangle Discotheques will accept music lists and requests in advance of functions & will endeavour to play a reasonable number of the clients' chosen requests, provided such requests are submitted in writing, at least 30 days before the event. The client also agrees that Triangle Discotheques cannot guarantee the inclusion of any difficult to source, obsolete or deleted titles either requested at the event or previously notified. Triangle Discotheques will in these circumstances willingly use music CD’s or certain other music sources provided by the customer as long as they do not infringe copyright laws. 11) Triangle Discotheques ensures that any equipment to be connected to a power source is electrically safe, has passed PAT electrical safety testing, and conforms to the HSE EAW Act 1989, and any amendments thereafter. 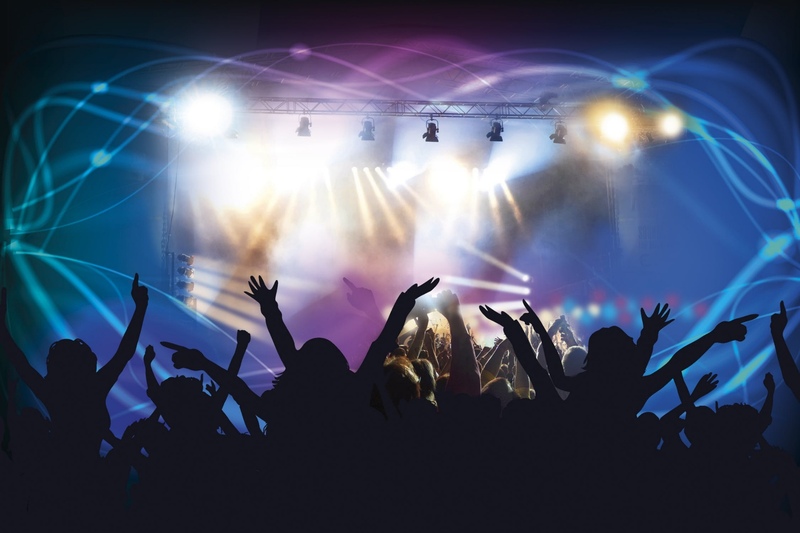 Triangle Discotheques will provide evidence of PAT Testing and Public Liability insurance to the clients venue where requested in advance. 12) If the client requests that we set up the equipment at an earlier time prior to the actual start of the function, the client acknowledges that a tiered charge may be made for this additional service, and that this service will be subject to availability. 13) Triangle Discotheques will not be liable for any refund, in part or whole, where we are late accessing the venue and setting up purely because of earlier events over-running, or where we are prevented from accessing, setting up or providing our professional services by the venue management. Neither will we be obligated to provide an extension to the agreed timescale on a pro-rata basis in these circumstances. 14) The client agrees that any damage to any of Triangle Discotheques equipment during setup, the function itself and whilst packing away, that is caused by a member of their ‘party’ will be charged to the client and payable in full within 7 days of the function date.